you will be right and amazed. The ultimate luxury is to conquer the laws of physics and get objects to hover in mid-air for days, weeks or even years. Mobile phones, jewellery or your favourite drink can now float up to 70 mm above the Elexor. The fascination of all onlookers is yours, and you can rest assured that even those who have everything will desire this. Getting objects airborne is what many magicians dream of simulating. But with the Elexor, you can accomplish this for real, going where no one has gone before. Find out how this magical feat can be a source of inspiration in your living room, dressing room or on your yacht. Feast your eyes on the finest materials and on the ultimate freedom from gravity. An overview of our products. 21,5 *21,5 *155cm // 55mm // 585g max. 30*30*155cm // 45mm // 2000g max. 38*38*155cm // 70mm // 585g max. The height of the plinth can be freely chosen. Please do not hesitate to ask us for custom builds. 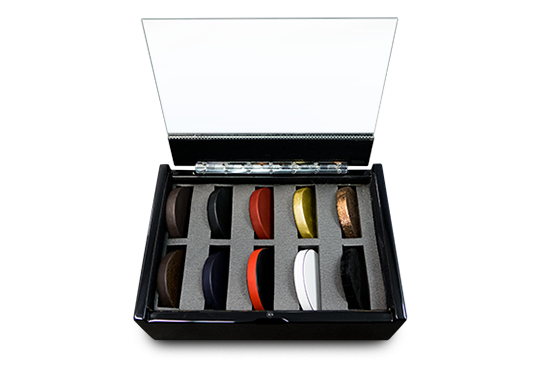 A wide selection of Pucks is available. A new lighting system for a futuristic look has been developed by the design and innovation brand Elexor. 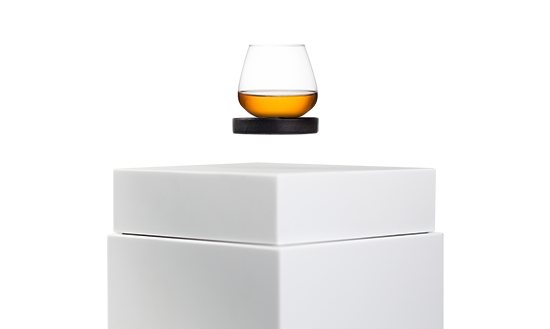 It is part of a luxury plinth that gets objects to hover in the air at a height of up to 70 mm. Developed to create an ultramodern look, the lighting is based on three elements. In its development, 70 different light sources where evaluated, in combination with 12 different types of optical fibre and 23 methods of modifying them. From these 19,320 possible combinations, only a single one proved ideal. Architect and designer Eugenia Neubauer explains: “An absolutely amazing sight that transforms a whole room. 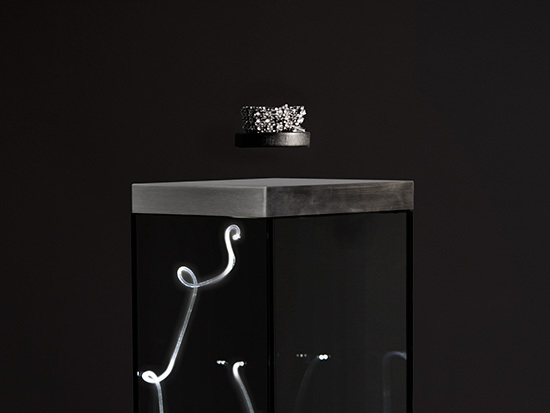 It is a signature item, even for the most luxurious surroundings, and a source of inspiration every day, by its mere appearance.” The two light- carrying fibres are 1800 mm long and formed to look artistic. 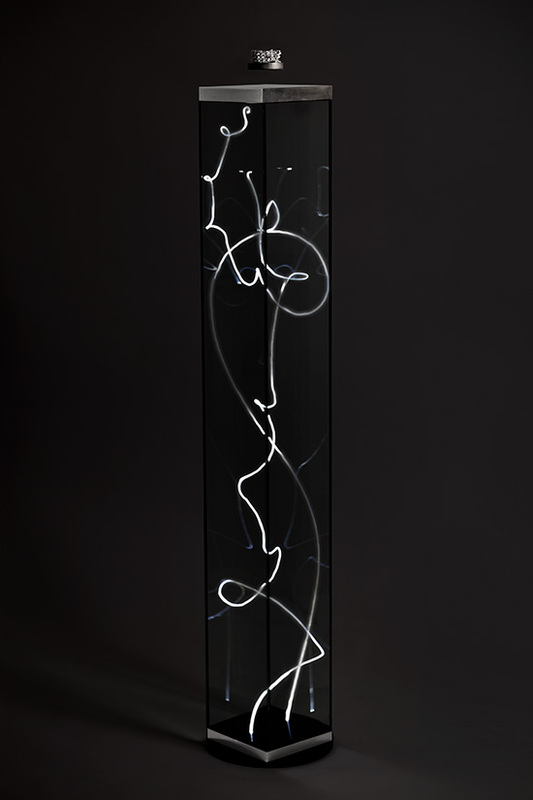 Inside the glass column, reflections create the impression of more than two light sources. The brightness is scaled for daylight, but when it gets dark the effect intensifies and illuminates the room in a unique way. The two powerful light sources themselves generate over 4000 lux at a distance of 300 mm – compare this to a conventional office workplace that requires only 500 lux. The luminous display may initially distract the viewer from the object, such as a filled cognac glass hovering above the column. But when the viewer spots the floating object, the attention instantly shifts. You can insert your hand between the object and the platform without disturbing it in any way. The intelligent magnetic fields keep jewellery, model cars or even mobile phones airborne, gently rotating them. When the hovering platform is pushed down, it bobs up and down and stays airborne. The floating zone is limited to the central area and a weight of up to 585 grams. This effect used to be only possible with superconductors and at very low temperatures until the development of intelligent magnets. Managing Director Oliver Plantenberg explains “Regardless how impossible this seems, it is now reality, and you can see and touch it. 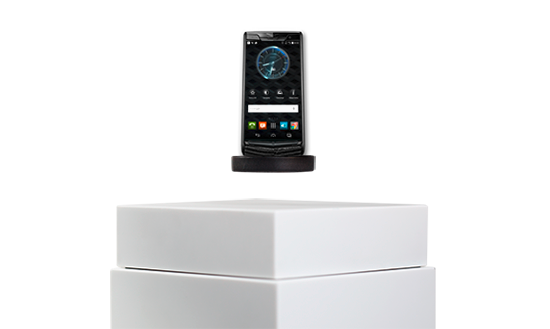 But you cannot compare it to anything, because there is nothing to compare it with.” The plinth called “Endless Flash” is designed for exclusive surroundings like yachts, stylish living rooms or top management offices. The product is being launched at the Masters of LXRY exhibition in Amsterdam. Priced at €27,800, and it is also available at www.elexor.de. Elexor develops unusual luxury design objects in Düsseldorf’s Media Harbour. Its small, 12-strong team registers several ideas for patent each month. The objects are built under contract in Düsseldorf and environs. 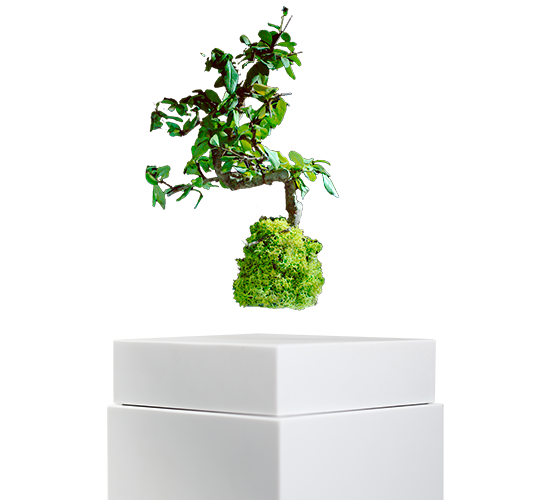 Elexor has won a number of design and innovation awards such as Red Dot, Popai in Paris and Superstars. It is a Brand of Usables GmbH.